Allegra Boverman/Gloucester Daily Times. Manchester Essex Regional Middle School sixth graders walked to Singing Beach and back to school on Wednesday to raise awareness about Haiti's plight. They have raised money to help an orphanage there and sent canned foods. The students relaxed and played at the beach. 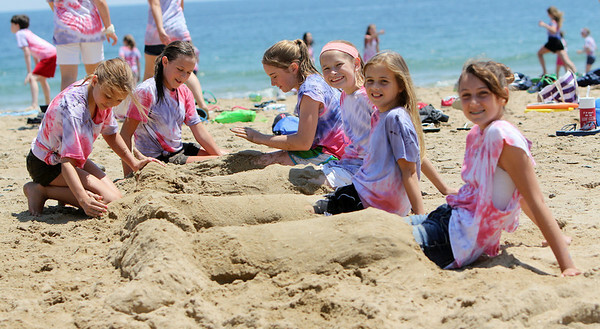 From left, turning their friends into mermaids in the sand are: Annie Martin and Emma Lacey. In the sand, from front to back are: Ava Glass, Suzy Morton, Belle Graves and Drew Charlton.